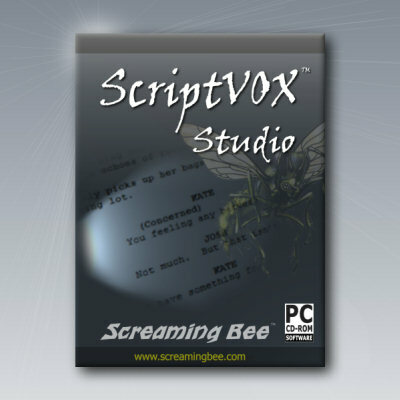 ScriptVOX Studio has the ability to rapidly prototype a story, script, narration, or screenplay. After assigning voices to the actors and the graphics to the text, a writer can playback their story as a multimedia presentation. In short order, a writer can find out how the dialogue and scenes flow. ScriptVOX Studio uses the latest SAPI 5.0 technology in Text-To-Speech (TTS) to produce the character voices. In addition, the built-in advanced voice-changing technology allows users to enhance and modify any TTS voice. With just a single voice, a writer can create a whole cast of characters for their story. Additional digital algorithms allow a writer to simulate environmental effects on a voice such as phone, radio, echo and robot. The storyboarding tool in ScriptVOX Studio provides a user with an easy way of associating images with the text in their stories. This allows writers to conveniently visualize their scripts and screenplays. Combined with ScriptVOX Studio’s file rendering capabilities, a writer can also create an audio or video presentation.